Tattnall County has a quirky place in history with one of the nation's oldest automobile routes running through the county and three of its communities. Dating back to 1922, the Woodpecker Route carried travelers from South Carolina into Florida before the days of numbered highways. Thanks to the Woodpecker Trail Association the old road is getting a new life. The Woodpecker Route began in Greenville, SC, and wandered through Georgia until it ended at Lake City, FL. The route passed through Greenwood and Trenton in South Carolina, and through Augusta, Waynesboro, Metter, Reidsville, Alma, Waycross and Homerville in Georgia. A 1923 Georgia map showed that the Woodpecker Route was one of 14 auto trails in the state. As highways were numbered and more roads added, the use of names for routes fell from favor and the Woodpecker Trail faded into obscurity. In 1947, a group of leaders from several communities met at Magnolia Springs near Millen to discuss the revival of the tourist route, this time under the name of the Woodpecker Trail Association. 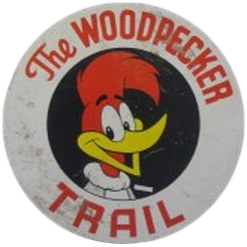 The association secured permission to use Walter Lantz’s cartoon caricature ‘Woody Woodpecker’ for the trail’s mascot. Signs with ‘Woody’ on them lined the highway from Charlotte, NC, to St. Petersburg, FL, some 620 miles. The Trail was promoted to the tourist in the northeast as the fastest way to the Gulf Coast. Florida and South Carolina changed their state highway numbers to match the Georgia State Route 121, thus tourist could travel through three states following the same state highway number 121. In South Carolina the trail followed SC State Hwy. 121 through Ft. Mill, Rock Hill, Chester, Whitmire, Newberry, Saluda, Johnston, Belvedere and North Augusta. In Georgia State Hwy. 121 went through Augusta, Waynesboro, Millen, Metter, Cobbtown, Collins, Reidsville, Surrency, Bristol, Blackshear, Hoboken, Race Pond, Folkston and St. George. In Florida, it followed State Hwy. 121 through Macclenny, Lake Butler, Worthington, La Crosse, Gainesville, Williston, Lebanon Station, Crystal River, Tarpon Springs, Clearwater and St Petersburg. In the late 1960s and early 1970s, the Interstate Highway System began to be completed and the travelers found a fondness for the fast lane, 24 hour restaurants, gas stations, motels and no traffic lights. This again reduced the tourists on the Trail and its use faded as a tourist route. By the mid 1990s, many travelers found themselves weary of the fast lane and again desired the much more scenic and relaxed two lane highways of old. Visitors to Welcome Centers would occasionally ask “What ever happened to the Woodpecker Trail” they remembered traveling as a child? Gradually an interest grew to again revive the Trail. The 10 counties in southeast Georgia met, felt the timing was right and began working putting together a plan to accomplish their goal. The group became incorporated with a representative from each county as well as many local and state agencies. An effort to again use ‘Woody Woodpecker’ as the Trail logo was unsuccessful, so the newly established board, began looking at the logo from the 1920s and began making modifications, such as color, a tree lined highway and a state highway sign. After several drafts, a great colorful travel-oriented sign was created. In 2004, the Senate and House of Representatives of the State of Georgia passed SR 843 designating GA SR121 as The Woodpecker Trail Highway from the Savannah River to the Florida state line. This legislation was signed by Governor Sonny Perdue on May 17, 2004. On September 19, 2005, Governor Perdue and others officially dedicated the Woodpecker Trail Highway in Augusta. The newly-designed logo was imprinted onto highway signs and erected along the Trail guiding the traveling public through the great communities, scenic farms, state parks, historic homes, and wonderful downtowns that are located along the Trail. RAC cards and new maps have been developed, printed and distributed to the visitor’s centers and Chambers of Commerce around the state. Efforts continue to bring the states of Florida and South Carolina back into this newly revitalized Woodpecker Trail.